Multiquip meets contractors' needs by providing the right roller for virtually any job application. Tough Tools for Every Job. 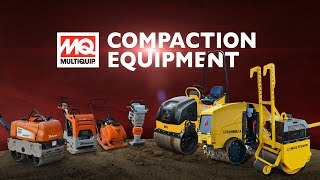 Watch this video to learn more about our extensive line of MQ Mikasa Rammers & Plate Compactors and MQ Rammax Walk-Behind, Tandem-Drum, and Articulating Trench Rollers. The ideal solution for asphalt patching jobs too small to be handled with tandem rollers. Dependability and performance make these rollers a favorite of contractors, highway repair agencies and municipalities. A fully enclosed hydrostatic-drive system offers infinitely variable speed control, smooth acceleration and braking. Double-drum rollers easily tackle large asphalt compaction jobs and feature built-in water tanks, hydrostatic drive and spray bars. The MRH800-Series tandem rollers feature a streamlined design that allows access to tighter areas. These versatile rollers are ideal for asphalt patching or compaction of granular soils. The MQ Rammax RX1575 articulating trench roller is designed to meet contractor expectations for performance and reliability. Contractors will also appreciate the flexible drum options with easy to remove drum rings to adjust from 33" to 24" working widths.